Look who I met in Pittsburgh! Edie, a canine ambassador. Canine ambassadors are part of many Fairmont Hotel locations throughout North America where the lobbies are calm enough to accommodate a tail-wagging guest greeter. What a fabulous idea, especially because most North American Fairmont properties are pet-friendly. Extra charges for dogs range from $25 to $75 per night (the highest in San Francisco and NO charge in Washington D.C. Georgetown, which offers a Very Important Dog service – more on that next post). There’s different weight restrictions at different properties. What better way to welcome all members of your travelling family than with a four-legged one of their own? 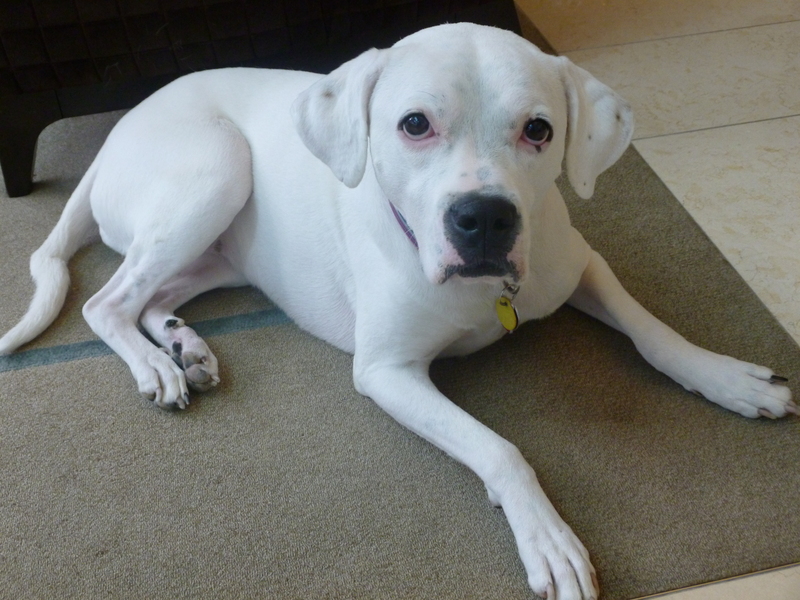 I’ve had the pleasure of meeting Edie, a friendly white dog, at the Fairmont Pittsburgh where she calmly accepts her greeting duties. 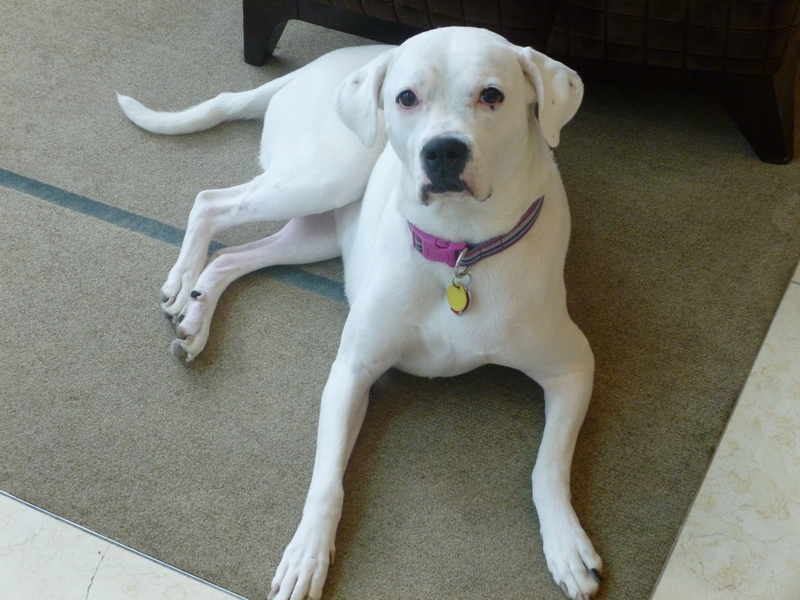 “Edie, a four-year-old Boxer/Lab mix, has served as Fairmont Pittsburgh’s official Canine Ambassador since 2011. Edie – whose name was inspired by Andy Warhol [a former Pittsburgh resident] and his ‘superstar’ Edie Sedgwick – welcomes guests to the hotel and accompanies them on walks. Before joining Fairmont Pittsburgh, Edie was adopted from an animal shelter in Ohio and spent over a year in the assistant dog training program at Circle Tail, Inc. Edie’s friendly and outgoing personality proved to be better suited to the hospitality industry, however, where she gets to meet new people every day. What to know more about Edie? Check out this article on Dog Tripper. Check out all the Fairmont Canine Ambassadors here. Travel Guide: Pittsburgh is a vibrant city that takes a least a full weekend to explore. 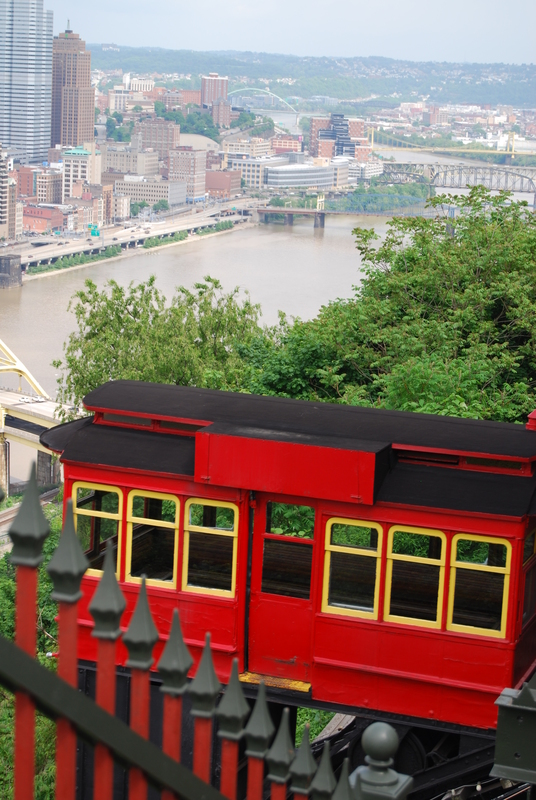 Highlights are many: Carnegie Museums of Art and Natural History; Carnegie Science Centre; Duquesne Incline for the best view of the city; National Aviary; a zoo and aquarium; Senator John Heinz History Centre; and three professional sports teams. Don’t miss The Strip district for vendors and street food, including a stop at the original Primanti Bros. location for an iconic sandwich with fries inside. Pick up thorough MOON travel guide here from Amazon. Pittsburgh is a very dog-friendly city and the tourism department knows the importance of promoting this feature. Check out the long list of dog fun here.